Gilbert “Gil” Krulee, professor emeritus of electrical engineering and computer science, passed away on January 18, 2017 at age 92. He will be remembered as a dedicated teacher and mentor, valued colleague, and cherished friend. 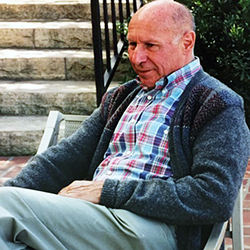 A member of Northwestern University’s faculty since 1960, Krulee was a pioneer in the fields of computer science and artificial intelligence. He proposed the creation and led the development of Northwestern’s Department of Computer Science and served as director of the University’s Artificial Intelligence Laboratory. He also had appointments in the Weinberg College of Arts and Sciences as a professor of linguistics and of psychology, two fields that helped inform his artificial intelligence work. Krulee enrolled in the US Navy from 1943 to 1946, serving in World War II as an engineering officer. He then earned his bachelor of science in chemical engineering from the Massachusetts Institute of Technology, where he also completed his PhD in industrial engineering in 1950. He took a brief break from engineering to earn a master’s degree in psychology from Springfield College in 1948. Soon after graduating from MIT, Krulee began his academic career at the University of Michigan. He left three years later to become an assistant professor of psychology at Tufts University and then an associate professor at Case Institute of Technology, now called Case Western Reserve University. When he joined Northwestern, Krulee stated his interest as “simplification and information theory with respect to man-machine systems.” At the time, computer science and artificial intelligence were a true frontier. Computers were still housed in large rooms, and personal computers would not come onto the scene until 1975. Because the University did not yet have a formal computer science department, Krulee settled into the Department of Industrial Engineering. Before Northwestern’s Department Computer Science (later to be merged into the Department of Electrical Engineering and Computer Science) was officially established in 1971, Krulee and a team of professors from various departments organized and taught the computer courses. Later, as chair of the new department, Krulee was responsible for hiring the University’s first faculty members who were dedicated to computer science, cementing Northwestern as an early leader in the field. Krulee was deeply interested in the computer processing of language and the rising importance of computers in general. Throughout his career, he witnessed the extraordinary growth of interest in computers and their applications in a variety of fields. He published many academic articles in several journals as well as a book, Computer Processing of Natural Language. He retired from Northwestern in 2000. Although he enjoyed his research, Krulee most loved working with people and teaching. He relished playing the trombone and was an active member of his community, serving with the City Mental Health Board and United Way of the North Shore. His friends and family remember him as a kind, gentle, compassionate, and patient man. Krulee is survived by Carolyn Krulee, his beloved wife of 46 years; daughters Catherine (Danelle Winn), Sarah Krulee Harms, and Margaret Krulee; grandchildren Rebekah Carlyn Krulee, Max Charles Harms, Douglas Edward Harms, and Myron Paul Jackson. A Northwestern memorial service in Krulee’s honor will be held at Alice Millar Chapel at 2 p.m. on Sunday, January 29. Contributions in his memory may be made to North Shore Concert Band, House of Welcome, or Journey Care – Marshak Family Hospice Center.